Astronomers have announced plans to build an ultra-stable, high-precision spectrograph for the Science and Technology Facilities Council's 4.2-m William Herschel Telescope (WHT - part of the Isaac Newton Group or ING on La Palma) in an effort to discover habitable Earth-like planets around other stars. Astronomers have announced plans to build an ultra-stable, high-precision spectrograph for the Science and Technology Facilities Council's 4.2-m William Herschel Telescope (WHT - part of the Isaac Newton Group or ING on La Palma) in an effort to discover habitable Earth-like planets around other stars. Dr Ian Skillen of the ING will present the new High Accuracy Radial-velocity Planet Search - New Earths Facility (HARPS-NEF) spectrograph in a poster on Monday 20th April at the European Week of Astronomy and Space Science conference at the University of Hertfordshire. Spectrographs analyse the electromagnetic spectrum of light emitted from stars and other objects and allow astronomers to measure properties like velocity and temperature. The super sensitive HARPS-NEF spectrograph is currently under construction by a collaboration between Harvard University's Origins of Life Initiative, New Earths Facility, and the HARPS team of the University of Geneva and is expected to start operation soon after 2010. A planet and its parent star orbit around a common centre of mass. As a (usually unseen) planet moves its gravitational pull exerts a small reflex motion on the star. The magnitude of this stellar 'wobble' is measured from the resulting Doppler shift imposed on its spectrum. A planet as small as the Earth causes a reflex motion of the Sun of just about 9 cm/sec, which is less than 1 km/hour, or equivalent to the speed of a rather gentle stroll! Other objects such as white dwarfs and stellar companions on the other hand cause a larger reflex motion in excess of 1 km/sec, and so are much easier to identify. By measuring the wobble of their parent stars, HARPS-NEF will use this technique to discover and characterise Earth-like planets from candidates identified by NASA's Kepler mission, launched on 6th March this year. 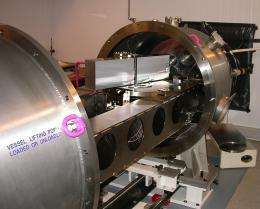 It will incorporate several improvements on the original HARPS spectrograph at the European Southern Observatory in Chile, most notably the use of a laser frequency grid or 'astro comb', which will provide the ultra-stable wavelength reference against which tiny Doppler motions can be measured with an unparalleled precision of a few cm/s over a period of years. Kepler will carry out a continuous 4-year survey of more than 100000 stars in the constellations of Cygnus and Lyra. It will search for the small, periodic dips in brightness that result from a planet passing directly in front of the star it orbits in a so-called transit. An Earth-like planet moving in front of its star causes a dip in brightness of about 1 part in 10000 and can last for several hours. However, other objects like the Earth-sized white dwarfs (compact objects that are the end state of stars like the Sun) can mimic this dip. So in conjunction with the Kepler observations, the HARPS-NEF measurements will allow astronomers to calculate both the mass and size of the orbiting objects and confirm them as planets. The mean density (from mass and size) will show if a planet is rocky and dry or rich in water. But determining the tiny changes in the motions of stars that result from orbiting Earth candidates is a huge challenge. It is the achievement of this precision and stability over many years that makes HARPS-NEF the most advanced facility of its kind in the world.